2016 was a mediocre year for fitness for me, and I'm wondering if that contributed to multiple illnesses over the year. I usually only call in sick one or two days a year, sometimes not even that. This year, I called in sick for at least six days, for three different illnesses. Ugh. The bout in October, with the cough that took me an entire year to shake, was especially bad. My diet has been crap overall: I eat too much, and none of it is particularly healthy. On the other hand, when I was healthy I did generally exercise four or five days per week, so there's that. 347,300 words of original fiction for the year. In addition, I'm about halfway through Fellwater, which I may or may not ever do anything with, but what the heck, we'll count it. Anyway, I've gone from the sort of person who felt like writing 500 words a day was unreasonably ambitious as a goal, to someone who thinks that taking three months to finish a draft means I'm slacking. I've also finally managed to write book-length-books, instead of doorstoppers like my first three finished manuscripts. Bonus! I published two books this year: Further Arrangements, in February, and The Moon Etherium, in September. I edited The Moon Etherium this year but haven't finished any other edits. This was the year for ALL THE WRITING and NONE OF THE EDITING. At least it feels that way. At a guess, I'm 10-15% done with the revision process for The Warlock, the Hare, and the Dragon. After a month. I need to build up some steam on this. I made less money in 2016 than I did in 2015, despite publishing twice as much work and getting royalties over 12 months instead of over 3. Yes, the first three months of sales for A Rational Arrangement were better than all the sales of ARA since then, plus all the sales of FA and TME. This is depressing but not really unexpected; at the time that I first started posting about ARA's sales, I thought they were largely due to effects that I couldn't duplicate again. Still, I am particularly sad about The Moon Etherium. It's made less than $200 in the first three months of release (that's less than 5% of ARA's sales over its first three months). I love this setting and these characters and looked forward to writing more about them. But with this level of sales, I can't justify sequels which will do even less well. I've drafted The Sun Etherium already, and will probably edit and release it for the ten people who are interested. But unless some miracle happens with sales, that'll be the last book of the series. I did a fair amount of sketching and small marker and digital pieces in 2016. I did probably my best digital painting ever, and decided it wasn't good enough to be a book cover. I did a couple of cover variants for Further Arrangements and I finsihed the headers for ARA and drew some new ones for TME. I don't really feel like I did much, art-wise, and I'm okay with that. I want to be a writer, not an artist. I did a lot of writing. Good enough. I didn't get out much this year, I went on four trips this year: two to Seattle to see terrycloth and other folks in the area, one to North Carolina to see my parents and visit Myrral, Kage, and Envoy, and one to Atlanta to attend ProgPower with alinsa. I did a few long-weekend events locally; Contra KC and WorldCon. I was on two panels for WorldCon, which I gotta say was cool. I got out a few others times to see Corwyn, but my main social outlet remains the Internet, and low-key methods of keeping in touch like Twitter, LJ, with some direct messaging in various formats. What a year this was. I've been basically happy for most of it. Some things have made me sad: the awful 2016 presidenial campaign and its unsurprisingly awful results. On a personal level, I'd hoped that publishing more books would revive my books sales and I'm sad that it didn't. But I didn't have any major bouts with depression and very little suicidal ideation, so that's good. I am pleased with the writing that I've done, both in quantity and in the stories that I've written. After I finished making all the revision notes, I've been reading and revising WHD in order. My goal for February is to get through at least 300 more pages. This feels ambitious, since I only revised 129 pages in December, but then again, I also made 16,000 words of notes. I can convert "time spent making all those notes" into "time spent revising an extra 170 pages". This goal assumes I'll revise an average of 30 pages per non-work-day in January, and do no revision during the work week. Since I revised 45 pages yesterday, this doesn't seem too unreasonable. It will also put me on track to finish first-pass revisions in February. I will probably do a little extra clean-up that's not page-by-page at that point, and then kick it out to beta readers. Then I can do final edits some time in March. If all goes well. I've been posting month-to-month goals, and I will continue to do that. But I actually have some goals for the year as a whole in mind, so I might as well post them here. Serialize and publish The Warlock, the Hare and the Dragon. Serial will likely launch some time in April-June. I'll release the book a month or so after the serial starts. Stretch goals: Finishing drafting a new book or three. Publish The Sun Etherium, probably in December. The release time frames are extremely squishy. If I get two books published in 2017, I'll be happy. I don't really care how late in the year it happens. The stretch goals seem ridiculously optimistic, but the truth is that I wrote much faster in 2016 than I ever have before and I don't feel like I'm going to slow down that much. And it would be silly to publish three books in 2017 and then have nothing written and ready to revise for 2018. So. Sure. I think it is realistic to revise three books this year and draft three new and different books. Also, I am a pod person and I'm very sorry if you liked the Rowyn I killed and devoured in 2016 so I could take her place. If it's any consolation, she felt no pain and also got to miss Brexit and the Trump election so, y'know. There's that. I got sick again on the Monday before Christmas, and then Christmas happened, and my diet has been kind of a wreck since then. I figure to get back on track in January. 1,600: forum posts & misc. It looks like a lot more than it is, because it mostly wasn't new fiction, and what was new fiction, Fellwater*, is super-easy to write. 4thewords.com continues to be a great motivational tool for me for writing, and a game I enjoy playing despite the fact that it's basically just "write and then write some more, just like you usually complain about doing". On the other hand, I do let a lot of kinds of writing count for 4thewords that I don't normally count: forum posts, long emails, LJ posts, FR fanfic, etc. So it encourages me to do writing that I regard as less like work. On balance, this is a good use of my "gaming" time. It is not such a good use of my "work on writing career" time. I think it did eat into time that I might have otherwise used to edit. I am very tempted to count words that I cut from my manuscript as "words written" for 4thewords, because cutting words is just as hard as writing them, for me. But I haven't gone that far yet. * Fellwater is mostly kink erotica, which is one of the reasons I am not invested in finishing it. I intend no slight against erotica writers here: I don't read published erotica and know very little about it. This is another reason not to publish: I don't know the genre! When I'm writing it, I find it easy to generate huge numbers of words, and I feel like this manuscript is absurdly long-winded. I find it hard to imagine that it would engage readers, and it's off-brand for the kinds of things I prefer to write in general. Some of my friends are curious to read it, so if I finish it I will let them do so and then decide if I want to go to the bother of publishing it under a different pseudonym. I launched the serial for The Moon Etherium. I began revising WHD, mostly by writing huge quantities of notes. I'm about 17% through my first revision pass based on those notes. It is going slowly. I find it very hard to make any headway during the week, and almost all my progress is made on the weekends. Nonetheless, it is going. I did eight headers for TME, and I think that was about it. I will discuss goals in my 2016-wrap-up post. I am finally over the doom-cough that I picked up in mid-October. \o/ And Thanksgiving leftovers are largely gone. I will resume calorie-tracking on Monday. I expect it'll be a mess through December because Christmas, but that's okay. I've been using the exercise bike pretty regularly since Daylight Savings Time ended. Usually only for 30 minutes, instead of the hour I do on my bike, but still something. 50,800 words on The Sun Etherium, to win Nanowrimo. 19,600 words on a new novel, working title of Fellwater. I started it for fun and am not invested in finishing it. 14,000 words or so of LJ entries and notes for Fellwater. 4thewords.com has proven a huge success as a motivational tool so far. I started Fellwater largely because 4thewords had a bunch of time-locked Nano events that I wanted to complete. It is, perhaps, too effective, because I really need to start editing books and I still want to write instead. Because 4thewords doesn't have any way to give credit for editing. Nothing on this front in November. I ... don't think I did any drawing in November. There was a lot of writing. I went to Contra KC! For all three days, even! I think I wrote about that earlier in the month. Overall, a pretty good month. There were some hard days, but mostly I enjoyed diving head-first into all that writing. * Begin serializing The Moon Etherium on December 5. * Make significant progress on editing one of my unedited books. I'm not setting a writing goal myself, but I know that I want to play more 4thewords, and maintain my streak in it. Just maintaining the streak is 13,764 words for the month (444 per day). Most of the good monsters are 1000+ words. So I'm guessing I will write more than 15k this month. These words won't all be fiction. I'm happy to count LJ posts and even forum posts or emails, if they're of significant length. I've been sick for the last 2 weeks solid. UGH. Anyway, exercise is down, eating is up, weight is about the same as end of September, which is more than I deserve. 18,500 words on The Sun Etherium, which I guess isn't bad for a month where I only had 11 days where I wasn't sick or on vacation. I still feel like a slacker. Manuscript is at 42,300 words now. Alinsa is still poking at Wordpress. Wordpress is still terrible. I may give up and start serializing The Moon Etherium by hand, on Dreamwidth and LJ or something. I did a few B&W doodles for Inktober. I might have drawn something else when I was healthy and at home. That seems so long ago. Oh, I did some sketches of Alinsa. And one of a centaur hippopotamus. That was probably it. I went to Seattle! \o/ I mostly visited terrycloth. ♥ We also saw alinsa for a Friday night Devin Townsend Project concert. That was great, and Friday evening was les rainy and windy then promised, so Alinsa showed up very early, and Terry and I a little early, and we were able to secure standing spots in front of the stage so we could see. Small nightclub venue, tiny stage, great view. :) The sound was imperfect; the singers were much quieter than the instruments. But I know Townsend's stuff well enough now that it didn't bother me much. The three of us met up with chip_uni, Eli, Munch, and her husband on Sunday for brunch. Then we went to the Starbucks roasterie down the block to see the Willy Wonka Coffee Factory (It's where they roast all their Reserve-brand coffee beans). Then went to a different nearby coffee shop for coffee, because most of the group did not actually like Starbucks coffee. After coffee, Eli had to leave, but the rest of us went to the Seattle Pinball Museum, which is more "play as much old pinball as you want for $15." I mean, there were museum-style placards on all the games, but all of them were also playable so ALL THE OLD SKOOL ARCADE. It was really fun. They had a Pac-Man. I still like Pac-Man. Baby Pac-Man, the pinball/arcade cross, is still a good concept and a terrible game. Even for free, it is too hard to be fun. *stares at this for a minute, trying to remember goals* Oh, right! I'm going to do Nanowrimo. That is why I am writing my month-in-review post before the month is technically over. I'll be going to a local convention the weekend after next, so my Nano schedule includes taking three days off for that. I have no idea if this will work. It did in April! I'll be working on The Sun Etherium. It might take less than 50,000 words at this point. If it does, I'm still counting that as a win. I decided to enlist a secret weapon in the Nano war, and signed up at 4thewords.com. It's a site that gameifies writing. I don't know if it'll be long-term motivational, but I tried it a little last night and it got me to do some writing I would not have otherwise. Good enough. My weight had crept up to 180 lbs, and I finally decided that I should Do Something About This. My new plan is simply "eat slightly less". I started on September 20 by tracking food & exercise, and have been averaging a net negative of 250 calories. That works out to around half a pound a week. My ideal weight is probably somewhere in the 110-135* range, so it's gonna be a few years before I get back there. That's fine. I'm not trying to get in shape for the beach season or something; I'm trying to return to a healthier weight that will not cause me the long-term joint problems that run in my family. This plan includes "eat when I'm hungry", which both means "do not eat to alleviate boredom and stress" and also "do not suffer in order to lose weight". I had a snack last night that put me over my calorie count for the day, for the first time since I started tracking, because I didn't want to go to bed hungry. Good call, me. So far, I do not feel like I am suffering on this plan, and that makes me a lot more likely to stick with it. My scale now says I'm 177 pounds. My spreadsheet (I'm tracking on a spreadsheet because it's actually easier than using an app, sadly) says I should be not quite up to losing my first pound. I am curious to see how my projected vs actual weight loss goes. The first few pounds always seem to be the easiest. 21,800 on The Sun Etherium for September. That was pretty much all my writing this month. I feel simultaneously as if this is Not Enough and also that I am being ridiculous and that's fine. That's over 225,000 words and there's still three months left in the year. Brain, please chill out. I did four different cover variants for The Moon Etherium, and a handful of sketches. I went to ProgPower with alinsa! Wow, it seems so long ago I almost forgot that was in September. alinsa and I plan to serialize The Moon Etherium, which means Alinsa has to worry about getting Wordpress set up again (I hope it's easier this time) and I have to figure out illustrations. There will be eighty installments of the serial. I am not drawing eighty pictures for it. But I do like having images to go with the posts. So I will go through the eighty parts and see if I can figure out some broad shared categories and come up with abstract illustrations along the lines of each category. Goal is 8-10 different illos. I will figure out what each will be before I do any of 'em. We'll see how that goes. I don't particularly plan to finish any of those in October, and I may not start all of them. I'll find out in November what I did! I painted the cover for The Moon Etherium. I am pretty sure I did some other doodles and sketches, but I'm writing this on my phone and don't feel like looking it up. To be honest, "I painted a cover" is a lot of art for me for one month anyway. * My air conditioner died during a weekend of 95+ temperatures and I had to call for emergency repairs. * After two weeks and contacting six different contractors, I called a friend who used to work in construction. He agreed to do it. * Lut and I moved everything in the den out of the den. Our computers and the reclining loveseat we use in front of them is currently set up in living room. The set up is basically functional. I have to clamber over the couch to get to my side, the light switch is hard enough to reach that we just leave it on, and the front door has gone from "hard to use" to "what front door?" * While trying to move the loveseat, I strained a muscle in my back. * While attempting to repair the hole, we discovered that the rest of the ceiling was also unstable. * My friends pulled the entire ceiling down. It's now halfway through August. I have a ceiling in the den again! It is aaaalmost finished: it needs one more coat of paint. Anyway, what I'm saying here is HOLY COW I CAN'T BELIEVE I GOT SO MUCH DONE THIS MONTH WITH ALL THAT GOING ON. I mean, I keep thinking "ugh work on this book is going so slowly compared to The Moon Etherium" but. Still. I wrote almost a thousand words a day and that's not counting the 15-20 hours I spent on editing TME. Or the cover, which took another 15 hours or so. Girl. You are not slacking. Quit it. I ... think I'm going to finish the first draft of Birthright? I've written, I don't know, another 14,000 words or so thus far this month. I think I have four-six scenes left. Even if that balloons out (and my scene count skill has vastly improved since I started joking about it last year), and even with WorldCon and an anticipated Zero Productivity Zone for the next five days, I don't think this is gonna take more than ten days to finish. And then I will have a first draft of Birthright. Granted, it needs ALL THE EDITING and it's pretty broken in places. And the book that preceeds it also needs lot of editing so the two work together better. But. Still. This is the book I have started and quit writing a half dozen times in the last decade. The prospect of having a finished draft, no matter how messy, is weird. Attractive! But weird. These last few scenes aren't gonna write themselves, though. Back to the word mines! Apparently I forgot to get to this at the begining of the month. Oops. Let's see if I remember anything I did! I finished writing The Moon Etherium! So that was cool. I made some notes for a sequel, The Sun Etherium. 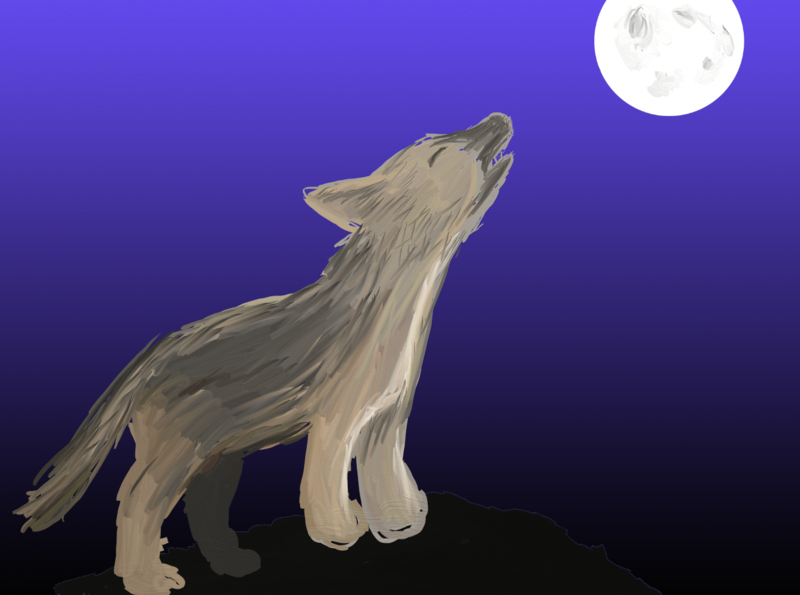 I started work on the cover for The Moon Etherium. I made a couple of versions that I kind of hate. I will see if I can hire a real artist to do the cover for this one. WISH ME LUCK. I finished first-round edits on The Moon Etherium and sent it off to beta readers. Did a few color doodles of characters from The Moon Etherium and a couple of random sketches, plus the aforementioned work on cover art. May was mixed. To be honest, I've been kind of depressed ever since I finished writing The Moon Etherium. Every now and then I pull myself out of the funk for a little while, but I keep slipping back into it. There were TWO WEEKS of bake sale at the bank in April. TWO WEEKS. Of delicious homemade junk food. Somehow, my weight hasn't changed. I dunno how that works, but at least it's working in my favor for a change. I wrote 67,000 words in April. I don't even know why I'm bothering to fill out the rest of this because "wrote 67,000 words" is pretty much What I Did In April. Nope. JUST WRITING. No business. The closest I got to business was putting A Rational Arrangement and Further Arrangements on sale after the serial ended. I did four little quick digital color things and one digital sketch. And I colored a picture from one of haikujaguar's books. No. I wrote in April. I talked to Lut, occasionally. Mostly, I was tired and also blindingly happy about writing a new book at what was, to be honest, a really fast pace by almost anyone's standards. Well, it's halfway through the month. I guess "Finish the rough draft of The Moon Etherium" would go on here. I finished that today. It's 109,000 words. I think I'll write about that process in its own post. For the rest of the month ... I don't know. I want to make a list of the changes I want to make during edits to The Moon Etherium. I kind of want to start another book outline just so I can stop being depressed that I finished The Moon Etherium. Maybe I will go back to doing not-enough-research. (Research is so fraught.) I might write some LJ posts? I have been really neglectful about posting to LJ. But if I take the rest of the month off, that's fine. I wrote a book in six weeks. I have earned some time off. It's getting warmer! Daylight Savings is back so it's light again when I get out of work! I biked after work every day in the last week of March. So that's nice. On the other hand, I've been snacking more in the evenings and at work, so no net change. Welp, this was kind of a disaster. I finished on scene in Birthright, and most of a second scene, and then decided that I should do some research before I continued on. Some serious research. Thus far, I've read a bunch of Wikipedia articles, one scholarly article, and one and a half books. I have learned a bunch of things! The books have been very interesting. I am an insanely slow reader when it comes to scholarly texts. I still don't feel like I know nearly enough. And I hate not making any measurable progress. I also wrote almost 12,000 words of Flight Rising fanfic, filling in the bios of dragons in my Flight Rising lair. Much of it was romantic. I decided it was time to admit that I really just want to write another romance where I don't have to worry about my characters being clever or coming up with a brilliant, A-HA resolution that ties the whole book together. So: I wrote a lot of stuff, most of which wasn't for anything I can sell. I don't think I did anything on the business end this month. It seems weird to go through these cycles where everything I do is business-stuff and then cycles where nothing is. Oh wait! I did my taxes. Which included all the extra paperwork from having a writing business. So that was related. I actually bought tax software for the first time ever. I may not bother with that next year, as I don't think my taxes were as complicated as I feared they'd be. I've been experimenting with digital doodling in full color, so instead of making quick b&w sketches, I do quick paintings. I haven't decided if I like them or not yet. Kind of? Anyway, I did about seven of these this month, and a couple of regular sketches, and three little marker pieces.. I actually got out twice this month! Once for a gem & mineral show, the second time for a Delain/Sonata Arctica/Nightwish concert. Corwyn & Kat took me to both. I had fun! Mediocre, I guess? I was frustrated by my lack of progress on 'important projects' in March, but I had a good time talking to people in FR and writing FR fanfic, so it wasn't all bad. Declare victory on research at the end of April whether I feel like I've accomplished anything or not. I wrote most of this post on the evening of Friday, April 2, and figured I'd add a few things and post it on Monday. That did not happen, because the previously-mentioned New Story ATE MY BRAIN. O_O I continued to work on notes and the story outline through the weekend. The new project, The Moon Etherium, has the solidest outline I've ever created. When I finished the outline, I wondered if I'd lose interest now: "I know everything that's going to happen. I don't really need to write it." But I was still keen to begin, and I started writing it last Tuesday. 10 days ago. The draft is now over 27,500 words. I would like to be writing it RIGHT NOW, but I am forcing myself to finish this LJ post and put it up instead. For the last ten days, I have been pretty sure that, at any moment, the New Book Energy for The Moon Etherium would wear off and I would stop wanting to write it all the time and crash down to a reasonable pace of maybe 500 words per day. I did slow down a bit yesterday! I think I only wrote 2200 words. Anyway. I'm just gonna ride this inspiration for however long it lasts. I am both very tired (Muse keeps waking me up in the middle of the night to jabber at me about The Moon Etherium) and very happy (YAY NEW STORY SO EXCITE). So if you're wondering why I've hardly posted this month: that's why. MUST WRITE MOAR. The three pounds that I gained last month have gone away again, yay. I have been mildly sick for the last week. I've gone to work anyway, but I've been unfocused, unproductive and exhausted while there. I napped for about two hours after work each day last week instead of exercising. And I skipped Conflation this weekend. The weather was gorgeous the whole weekend, and I didn't get on my bike for even a short ride. I was feeling mostly better by Monday, so I got back to exercising yesterday evening. I finished seven scenes of Birthright this month, which to be honest is about half what I wanted to get done, and still more than I expected to do. I haven't finished any outline points yet, which is unsurprising; my estimate spreadsheet pegs the current point at a whopping 14 scenes. This part of the book was much easier to summarize than to write out. I tried a new technique over the weekend: writing to a timer. Some of my friends on Twitter have talked about working in "pomodoros", which default to 25 minutes long. I did a quick Google search on the topic, and came up with the basics being "work for 25 minutes, take a break for 3-5 minutes, repeat 3 more times, then take a 20-30 minute break". I do not know the reasoning behind this, or actually anything beyond what I just typed, so I make no claim to doing this right. I have tracked my writing based on time before, but never actually set a timer. It was always "write until you feel like stopping or for 15 minutes, whichever's longer." Anyway, I closed all my desktop distractions, set a timer (using timer.onlineclock.net), and started writing. I did let myself look up references relevant to what I was writing. The most interesting thing about the experiment was that I found stopping when the timer went off annoying. Partly, this because the default timer sound is jarring, and I switched it to a pleasant harp-sound after the first time or two. But the act of stopping still irked me. "I'm in the middle of a sentence here! Let me finish." Mostly, I didn't let myself finish. I figured stopping while I still wanted to write would make it easier to get started again. I didn't use the formula described above, but I did write, undistracted, for four periods of 25 minutes each on both Saturday and Sunday. I wrote about three scenes this weekend that way. This was a productive weekend, by my modest standards, but the tactic feels more like a gimmick than an approach I should depend upon. Still. As long as it gets book written, I'll take it. I made a website! Ladyrowyn.com is no longer just a redirect to rationalarrangement.com. It has actual content on it, albeit not much. I used plain css and html for it, instead of trying to learn Wordpress. So the "blog" part just links to my LiveJournal. Everyone tells me this is a mistake and I pretty much don't care. I like LJ. Yes, LJ might fail on me, but I kinda feel like I am more likely to bork a Wordpress update and take months to get it running again than LJ is to die. Though it wouldn't kill me to cross-post to DreamWidth again as backup. I need to do a monthly "RA sales" post. The short version is "sales are up, but not spectacularly so." FA gave a modest bump to RA's sales, and is itself selling, at something like 25% the rate of RA's first month. I finished the RA headers! \o/ All seventeen of them. Also drew 4 marker-pics from Twitter prompts, and one digital picture that I started coloring and may or may not finish, and three digital sketches I probably won't color. And I made a rough version of the cover image for my current WIP. Which is a long way out from publication and hardly needs a cover yet, but I was curious if the design I had in mind would work. I think the concept is sound, although I might yet go with hiring a real artist for this one. I waffle on this, less because of the cost involved than because my primary market is e-books. I feel like the traditional "highly detailed paintings" of print covers are actually less appealing than a simple, stylized design, once they're shrunk down to a height of 250 pixels. Yes, my cover is my main ad, but that ad is 250 pixels high and it needs to be effective at that size. I reinstalled CivV. This was less disastrous to my productivity than I'd feared. terrycloth, alinsa, and I have been playing it co-op in the evenings. It is still slow, but we will probably manage to finish a game after 8-10 hours of play. I finished a game by myself over the weekend, and then decided to try a game on Continents, just to see if it's as bad as I remember. I usually play on a "tiny islands" or "archipelago" map, because the AI Civs are a LOT less likely to declare war if they don't share a land border with me. I have been more open to building military units this game (I hate fighting in Civ, it's such a slog, but if I avoid military as much as I want to, the barbarians get annoying, never mind the AI civs.) It seems to be going all right. We'll see. I was supposed to go to Conflation this month but noooo. I did meet up with a couple of St. Louis friends who'd come to my city for the weekend, and we went to the Toy & Miniature Museum. Which I haven't been to in about 12 years. The miniatures collection is even larger and more astonishing than I remember. I want to shrink down to miniature height so that I can live in those doll houses. Corwyn's birthday was last weekend, and I got out for that, too. \o/ Had a fun time at Dave & Buster's, playing video games. With the headers done and Further Arrangements out in the wild, I am running out of ways to avoid working on Birthright. I really want to set an ambitious goal, like sixteen scenes. But ambitious goals usually paralyze me into inaction, so let's not go that route. I like modest goals that I can not only accomplish, but hopefully obliterate. * Write 8 scenes of Birthright: I almost managed this in February, where I had a bunch of other stuff to do and two fewer days to do it in. This should be fine. * Do my taxes. I will probably break down and finally buy tax software this year, since I have a second source of income and a business now. Any recommendations? * I made a webpage for ladyrowyn.com (it's not yet available because my web host, alinsa, has to install it at the domain.) I am probably not going to make much fuss about the webpage when it's live because the content on it is all stuff that people who follow me on social media already know. It is targetted at people who found my books on Amazon or via a friend's recommendation and then want to know more. It is unexciting but adequate to the task of "here's what I've written, here's where to buy it, and here's where to find me online." * I drew four little marker-colored pictures from prompts, and four digital pencil sketches on the theme of "monster girls and pretty boys" after seeing someone on twitter complain about the proliferation of "monster with pretty girl" pictures. I want to color one of the digital sketches but don't know if I'll get around to it. * A tiny bit of writing, but no scenes finished. My brain doesn't want to think about writing in any kind of coherent fashion, which explains all the drawings. Maybe I will work on an illustration of something I'm actually writing next. RADICAL. Other than relief, I keep thinking, "What can I do to pretend to be productive now?" I don't mean "actually productive": that would mean writing and other things that require thought and work. The headers had the value of taking relatively little creative energy and still making me feel like I was doing something useful. I am not sure what I'll do for that now. Poke at making a basic website thingie, maybe. Or it might be "write dragon bios and be active on the Flight Rising chat again", which is kind of what it looks like so far. But that doesn't give me the same feeling of accomplishment, so probably not a good substitute. Well, something'll come up. I went for a twenty-mile bike ride last weekend! Because the weather was actually nice despite it being January. I also gained 3 pounds last week because I ate tons of junk food. Oog. I did well on not eating too much the last couple of days, at least. Maybe it's the start of a new trend! I think I wrote like half a scene since my last update. I'm at 8.5 scenes total for January, and two bullet points finished. BOOK. 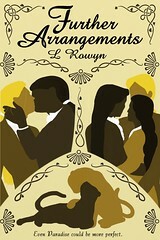 I uploaded Further Arrangements to Amazon and Draft2Digital on January 31. I am not quite done with the book, though, because the print version is still in final stages and will need to be proofed and uploaded. Amazingly, the e-book version populated to all four stores within 36 hours and without any weird "why isn't it working the same way when I buy it from this outlet that it does when I looked at it before uploading and in the distributor's upload-page previewer?" glitches. I also did all the associated tasks with BOOK: cover art, dedication, acknowledgements, updated author bio, interior illustrations, book blurb, placement in SFWA's new release newletter, etc. It's a lot. Easier than last time, though. I had a goal of 13 headers and finished 15. I did 14-16 or so sketches of hands. Maybe someday I can draw a hand that looks more than vaguely hand-like. I saw a couple of friends from St. Louis last weekend, and we went to the Toy & Miniature Museum. The miniatures were as amazing as I remembered. I want to shrink myself down so I can live in one of those dollhouses. A few bad patches, but overall, pretty good. I was very stressed out about the book launch on Sunday and Monday especially, but I'm mostly back to normal now. Also, did everything on my goal list for January AND MORE so go me. I am still feeling somewhat ground down by the effort of turning Further Arrangements into a book people can buy, so I don't want to make an ambitious list of goals. Let's go simple. 17 headers. That'll take me through the end of the serial. Talk to Alinsa about putting something on ladyrowyn.com other than a redirect to rationalarrangement.com. Probably nothing fancy, just an "I'm an author, here's my books, here's links to my LJ, Twitter, and RationalArrangment.com". Write some fiction. Doesn't have to be Birthright. Doesn't have to be any particular quantity. Weekly Update: final one for January! * Sent the cover of Further Arrangements to alinsa to do the typography. * Made some interior illustrations for the FA title page and for each of the novellas, based on grayscale variants of the cover image. For everyone who thought that picking the triangular-sections cover meant you'd escape the twee image of greatcats making a heartshape: that image now appears on the back cover, spine, and title page. MWAHAHAHA. * Drew five pictures from Twitter prompts, all of them on the theme of "what would your artist/marketer/business manager look like? ", a la haikujaguar's "The Three Jaguars". The prompts for this one were great. * Sketched some hands in an effort to get less awful at drawing hands. * Refined estimate on number of scenes in Birthright. I didn't do much writing this week, and realized on Saturday that part of this was because (a) I didn't want to count just words as "progress", and (b) my next bullet point on the outline was going to take a lot of scenes. So instead of pretending I thought each bullet point would take four scenes, which was clearly absurd, I figured out how many scenes each completed bullet point had taken (0 to 15, with the mode being 2 and the average 4.75). Then estimated how many scenes each of the remaining bullet points will take. This will make reporting my "remaining scenes" count much more fun. The total based on my first set of estimates was far too low, so I doubled most of them. I really want to finish a lot more scenes-per-month that I have thus far in January, though. My current rate is just two per week. But in February I won't have all the work for FA hanging over me, so perhaps I can get up to three per week then. I'd like to finish this draft before the end of the year. And pretend it's not going to take me another year to revise it and its prequel. On the other hand, I want to note that I completed all of my January goals by 1/23/16, went back and added some more goals, and completed those too. BOO-YEAH. So not feeling like a slacker, here. It's been a week since I said I would write weekly updates, so I guess I'm due? Tuesday seems like a weird day to do this, but sure, why not. Since last Tuesday, I've finished seven headers, which puts me at my goal of thirteen for the month. Yay! 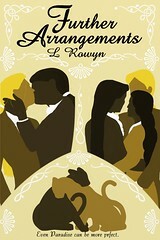 I also did a draft of the cover for Further Arrangements. The initial illustration looks all right, but I think I'll try a different layout for it and see how I like that. But the big news of the last week is that I have been Hardly Writing again. I go through various phases in regards to writing, in no particular order and for no special reason. * Not Writing At All: Sometimes because I'm busy with other things, like editing, illustrating, business stuff, working out outline, or whatever else might distract me from writing. Sometimes it's because I really, really do not want to write. Sometimes a combination of these factors. * Writing: I am writing when I'm at my computer: before work, after dinner, on the weekends. Time when I could be goofing off and playing video games, but I am choosing to write instead. * Inspired: This is when I am energized and excited about writing, and choose to spend most of my available time on doing so. I am rarely inspired. * Hardly Writing: I haven't given up on writing, but I don't want to do it and largely avoid it at home. So I will convince myself to do it during bits of useless time: walking to/from work, while on lunch break, while using the exercise bike. "Hardly Writing" and "Not Writing at All" feel very similar to me in some ways. They're both states where I feel as though I'm wasting too much time that I ought to be using writing. In both cases, I feel like I have plenty of time for non-writing tasks and leisure. But the key place where it's different is that I get a surprising amount written while "hardly writing". I started on Wednesday, and did no writing over the weekend, yet I've still written almost 4,000 words. This is perceptible! It's much faster than the progress I made on Prophecy back in 2002-2004, and I felt then like I was constantly working at Prophecy. But working on A Rational Arrangement went faster, too: even when I felt like I was hardly writing, the manuscript continued to inch forward towards the conclusion. I am writing Birthright, a book I've tried to write and abandoned before. I'm about 20% through it at the moment, and I have a long, long way to go. But I am feeling good about this attempt, paradoxically because I do not feel that good about it. I am not inspired, and I am second-guessing my choices, and I am struggling with how to portray events, and I am writing it anyway. I'm not serializing it anywhere, and no one is telling me "it's good, write more!" I'm just writing it. And making a reasonable amount of progress, without feeling as though I'm stressing myself to make progress. It's early yet in this particular phase, so I might yet lock up and quit (again), or decide I need to write another romance novel in the Paradise setting because I know there are readers for that. We'll see. Birthright's outline has 42 bullet points. The ratio of outline-points-to-scenes on the last two novellas I wrote was 1:2. But the outline-to-scene ratio on RA was much worse: 1:5.75. I succeeded at my goal for last year! So I'll make that my goal again this year: post an update at some point each month that describes my activities for the previous month. I've added a new section to my month-end template, for "Goals for Coming Month", where I can add any short-term goals I might have for the current month. Write weekly update posts about whatever I've been up to. That seems like plenty enough goals for one month. Grayscale illustrations for the title page of Further Arrangements and the three novellas [just variants on the cover illos]. Apparently that wasn't enough for one month? Don't be getting any ideas about how productive you can be, self. This was an outlier! Also, too many items on the to-do list is will crush your soul. Modest goals I overshoot are much better than ambitious ones I miss.